So, you know about Fort Drum. And the snow. But what about the other unique settings that surround the base? There’s plenty of opportunity to try a different lifestyle in nearby cities like Dexter and Evans Mills. Try your hand at living the quiet life down a country road or finally be able to bring your horses to a house with property to ride. Lakeside life is also a possibility, just miles from work at the base. If any of these options sound like the ideal fit, read on, because MilitaryByOwner’s homes of the week have special features that aren’t found in your typical home listings. Rustic ambiance meets modern finishes throughout this farm house in Watertown. The best of both worlds is waiting for the next buyer who relishes in both tradition and updated conveniences. The limestone exterior, wooden ceiling beams, and extra wide planked wooded floors are reminiscent of early American settlers who laid claim to the region. 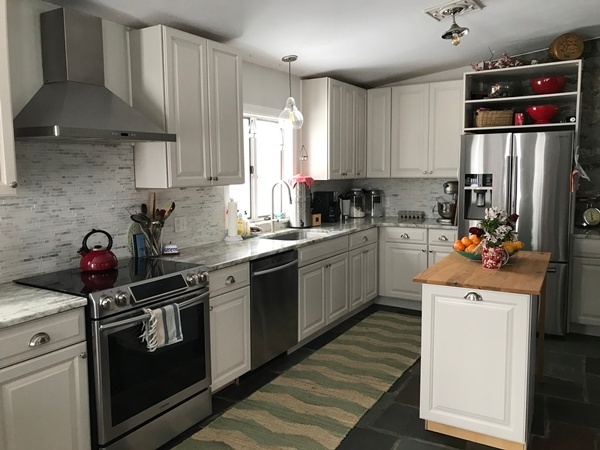 Upgraded bathrooms show off custom Carrara marble tile, while the kitchen has new quartz counter tops to blend with the stainless-steel appliances. The main living area features an enviable fireplace that happily becomes a beautiful gathering point. Outside, mature landscaping and gardens are easy to maintain and the detached two-car garage provides plenty of storage and protection from the elements. Three acres of land accommodates a buyer looking for horse property that also has a convenient commute to Fort Drum— a combo that isn’t often a possibility during a PCS. If the Great Lake life is the stuff that your dreams are made of, make a serious effort to check out the water access and views Pillar Point provides. Year-round lake adventures await the next renter. 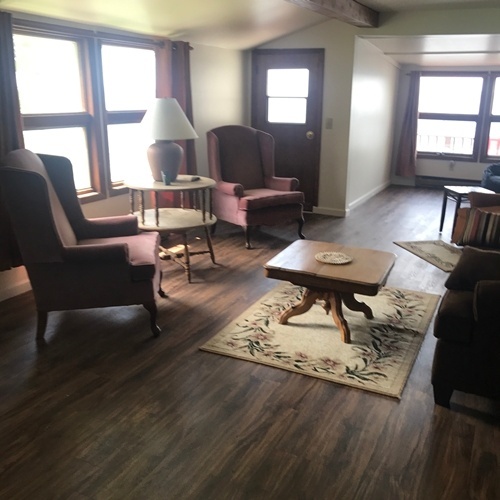 The front porch is a lovely, welcoming space with room for seating and entertaining guests who enjoy natural beauty and peacefulness that is lake front living. Inside, the house is equipped with a remodeled kitchen and new flooring in the living spaces. Natural light is plentiful and beautifully highlights picture windows and the unmatched views outside. A bonus feature of the rental agreement is the that the monthly rent includes furnishings, plus heat and electric payments. A washer and dryer are also available for your convenience. Safe, quiet, and spacious are very good descriptors to read in a potential rental home property listing. To also have a cul-de-sac location means plenty of area to play and enjoy the acre of land the house sits on. Children will love the fenced-in playground on site and parents will love the storage shed to house military gear. If more storage is needed, the two-car garage has the square footage to spare. 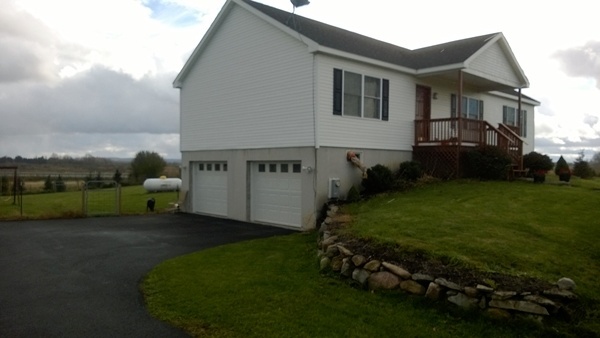 The land size isn’t to fret about—the owner leaves a lawnmower and snow blower for the renter’s use. Rest easy, all of the bedrooms are upstairs to include the master suite with a walk-in closet and a jetted garden tub. The remaining bedrooms share a full bathroom. Open concept living is available downstairs, combining the kitchen, dining, and living rooms. The walk-out back deck extends entertaining space further for larger gatherings. The basement provides more room to live and play, with controlled heating and air to keep the temps comfortable. The space is ideally suited for a play or family room because a conveniently located half bath is available. Again, more outdoor space for hosting friends and family lies beyond sliding glass doors that keep plenty of sunlight streaming in. As the house was built in 2007, it has substantial energy efficiency due to the upgraded windows, appliances, and insulation. The cities surrounding Fort Drum have quite a few homes with unique features that make moving to New York extra special. Lake fronts, horse properties, and homes positioned on cul-de-sacs are only a few of the special feature homes listed on MilitaryByOwner. 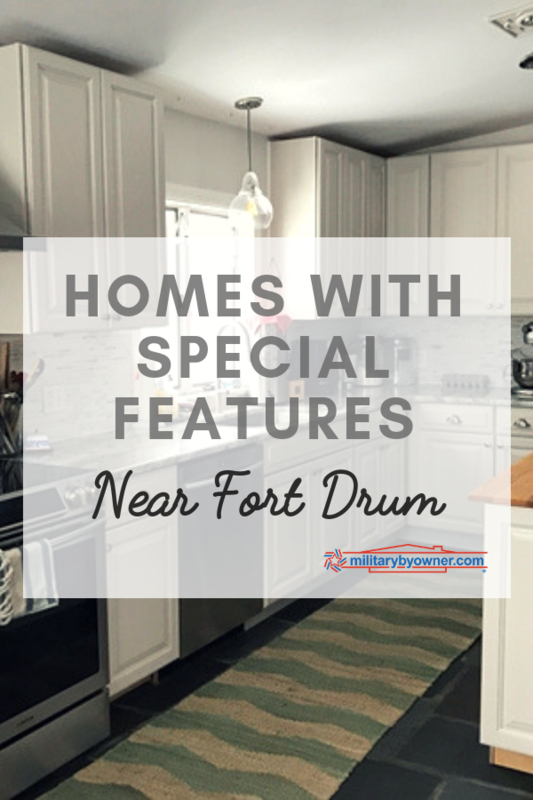 Browse Fort Drum’s available properties by using the Search Filters option and then choose Special Features to find a unique property to suit your needs.